A surgeon who developed the UK's brace position, passed Wayne Rooney fit to play in a World Cup and saved a woman's life with a coat hanger is retiring. 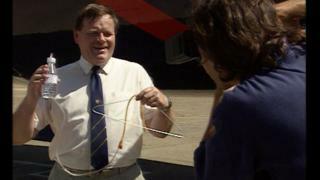 Professor Angus Wallace developed the brace position after researching injuries in 1989's Kegworth air crash. He hit the headlines when he treated a woman on a flight with a coat hanger and when he operated on Rooney in 2006. At his retirement party in Nottingham, the Scot said he had learned to live with the English. Mr Wallace was working at Queen's Medical Centre the night a plane crashed on the M1 near the Leicestershire village of Kegworth in 1989. His research on the injuries sustained by the passengers, 47 of whom died, lead to the adoption of his brace position for passengers in the UK. "We did five years of research to establish the best position and in 1995 the Civil Aviation Authority issued instructions to airlines to use the brace position as the standard in the UK," he said. He said it was "probably responsible for some lives being saved - even now". He hit international headlines when he saved a woman's life on a Hong Kong-London flight in 1995 using a coat hanger to treat a collapsed lung and five-star brandy to sterilise his improvised equipment. He was congratulated for the mid-air operation by the Prime Minister Margaret Thatcher, but was told by his wife when he returned home that "the garden needs digging". And in 2006, he brought hope to millions of English football fans when he declared Rooney fit to play in the World Cup after he broke his foot. Mr Wallace, who moved from Dundee to Nottingham in 1973, said he now had many English friends. "The English are ok, I've learned to live with them. In fact they have become very good friends," he joked.